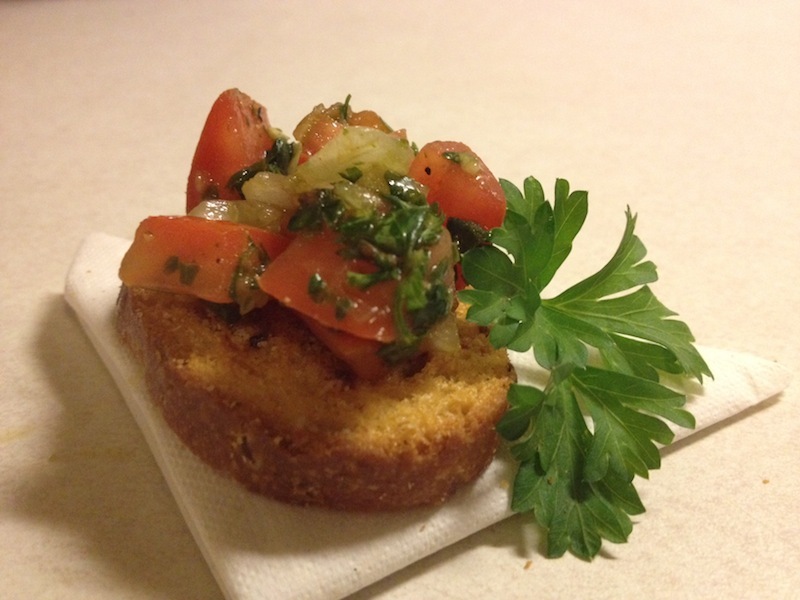 Here is an excellent recipe for some Italian Salsa, Bruschetta. It’s usually severed as orderves at parties, but it’s a great snack for anytime. I don’t use any measurements for my recipes, because when I cook, I only measure by relative flavor. I will however, give you relative ratios. That way you have a general idea. But the exact amount is all based on personal preference. The ingredients are in order of amount. Slice and Dice the Roma Tomatoes so that they are 1/2 Inch Cubes. Slice the Onion so that they are smaller that the Diced Tomatoes. Mince the Basil, Oregano, Cilantro, Parsley, and Garlic. Add everything into a bowl and mix. Add enough Extra Virgin Olive Oil so that every ingredient is coated, with a little extra pool at the bottom. Add a splash of Balsamic & Red Wine Vinegar. Add fresh ground Black Pepper for Taste. Mix everything very well and let it marinate in the refrigerator for 24 hours. The oils & vinegars will penetrate the ingredients and it’ll taste a lot better.